The Huffington Post has an article with Thanksgiving beer suggestions by Justin Philips from Beer Table. Three of the six are sour ales: Rodenbach Grand Cru, BFM‘s Abbaye de Saint Bon Chien, and the Leipziger Gose from Bayerischer Bahnhoff. My family had Thanksgiving early this year, and it occurred to me that sour ales are particularly suitable for Thanksgiving. In many ways a sour ale is much like a fine wine, seeming to balance the food in a way that a lot of beer doesn’t. Also it’s a really good chance to challenge your family and friends’ expectations about beer. The large (wine-sized) bottles it’s sold in encourage sharing. Here are several sour beers I think would make a good addition to a Thanksgiving table. Mariage Parfait, the oude geuze from Brouwerij Boon in Lembeek, Belgium, compares favorably with champagne. I’ve written about the rich aroma, which seems light but draws you in, and the bold yet approachable flavor. Another good choice to match a Thanksgiving meal is Duchesse de Bourgogne from Brouwerij Verhaeghe in Vichte, Belgium. This is a richer beer, with a strong flavor reminiscent of balsamic vinegar. It also has dark fruit and port character. This is one of my favorites; you can read more about it in one of my two reviews. My last suggestion isn’t actually sour, but it is brewed with Brettanomyces wild yeast. It’s Alive from Mikkeller, the gypsy brewer, also has a bright champagne-like quality. But It’s Alive is a little stronger and has a healthy infusion of hops to boot. The balance between the hop bitterness and the earthy character from the brett is masterful. Collaboration beers are all the rage these days: Avery and Russian River’s Collaboration Not Litigation Ale (a blend of beers both named “Salvation”), the Brooklyner-Schneider and Schneider-Brooklyner Hopfen Weisses (the latter of which I’ve rated), the new fruity and malty Van Twee from the minds of De Proef and Bell’s, as well as Flying Dog’s Collaborator Doppelbock, product of the Open Source Beer Project. I’m sure I’m missing scores of unique ones. The reason I mention this is that tonight the first beer I am trying is a collaboration brew from Two Brothers Brewing in Warrenville, Illinois, and the Urthel Brewery in Ruiselede, Belgium. Named Moaten (after the Flemish word for “friends”), this oak aged sour is brewed in the style of a west Flanders red. The Moaten pours a lightly hazy rust color with some creamy off-white head. The nose is light and somewhat flat. A bit of caramel malt is evident but a dry, somewhat metallic character intervenes. I can detect hints of fruit, perhaps raspberries and oranges. The taste is also flat but not as much so, with a flavor really representative of an American amber ale. Malt character is the strongest, toast and bread with some caramel. Some fruit is present, and some oak. Just the slightest hint of an acetic tart. Slightly cloying. Not a bad beer, just not at all what the label tells me it will be. Anyway I had high hopes but low expectations for this one: both breweries are generally great but neither brews sours regularly. Moaten is a beer that talks big but doesn’t quite deliver. Next up is a beer that makes no claims to style other than “Swiss ale de garde … aged in oak barrels”. However just one whiff and you know it’s a Flanders-style red. 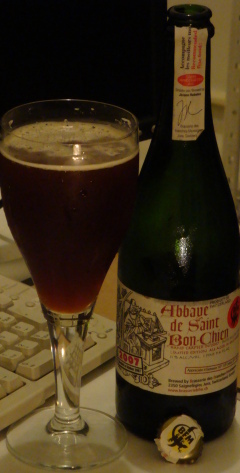 One of the best non-Belgian sours I know of, the Abbaye de Saint Bon-Chien is brewed by Brasserie Des Franches-Montagnes (BFM) in Saignelégier, Switzerland. This beer (named after the late brewery cat) is aged in wooden barrels that formerly held one of several wine varietals as well as a few used to age grappa, so the complexity should come naturally. My bottle is a vintage 2007. A bit of creamy tan head sits atop the turbid, mahogany colored Bon-Chien. Not a lot of head but what is there lasts and leaves an artistic lacing. A rich aroma wafts out: fruit, wood, malt, funk, and sour. Cherries, raisins, and blackberries with a vanilla oak character. A light caramel malt sweetness balances an acidic, cider vinegar nose. Just a bit of sweat adds a funky interest. Great sweet and sour combination. A dense and difficult flavor. This is a high compliment: the various tastes do not fight for attention, but they do alternately subdue and enhance each other. This beer requires contemplation. At first a sweet maltiness is paired with a significant bitterness. The bitterness is revealed to be an alcohol warming. The maltiness fades and is replaced by a cidery tart. The spicy and sour flavors bring out a strong fruitiness: red apples, cherries, and prunes and a hint of brandy and mulling spices. Some balsamic vinegar rounds out the sour taste. A lively carbonation, healthy tart, and restrained but definitive alcohol flavor. P.S. Thank you Peggy Sue for knocking half my glass of the Bon-Chien all over the desk and keyboard. I literally tried lapping it up before I realized it wasn’t any good anymore. I had to get a new keyboard in the middle of writing my post. Seriously!